We are proud to present another of our interview features. This time Sam Scott has interviewed author Stephen Jacobs. Hi Stephen, many thanks for taking time from your busy schedule. Please, tell us about your book. 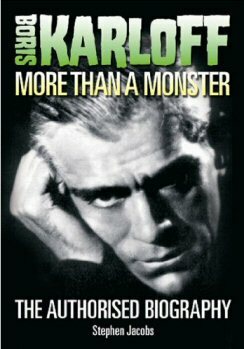 My book is called Boris Karloff: More Than a Monster and was published by Tomahawk Press in January 2011. It's hardback, over 500 pages long and it weighs too much to read on the train! In the late 70's & early 80's the BBC would screen seasons of horror double bills. Usually there was a black and white Universal film followed by a Hammer film. These great nights were my introduction to the world of classic horror. I had seen many photos in magazines and books but this was the first time I got to see the actual films. Of all the actors I saw it was Karloff, initially in his role of the Frankenstein Monster, that fascinated me the most. He could play anything - monsters, madmen, detectives, comedy and even sympathetic characters - and he was eminently watchable. I tried to find out more information about him but the pickings were rather thin. So, eventually, I decided to look for myself and that begin my years of research and writing. What research went into the book? I started researching the book around 1999, as I said, initially for my own benefit. In all cases I tried to go back to the original quotes wherever possible. Karloff's pre-fame years were spent in England, Canada and the U.S. so the area of coverage was very large. Fortunately for me more and more archives were being digitised and being made available online - or, at least, a list of their contents were. That allowed me to contact them for more information and turn up some very interesting information. I was able to contact many who had known or worked with Karloff - like Michael Gough, Robert Hardy, Francis Matthews etc. - and they were all very, very kind. I was rather surprised at this as, when I started my research, I didn't even have a publisher! Why do you think Boris Karloff managed to have such a long and surprisingly varied career? I think it's down to the fact that he simply loved to act. Stardom offered the financial security but it wasn't the be all and end all for him. He had no snobbery about films or TV being inferior to the stage. In fact, he had his own TV show, Starring Boris Karloff, in 1949. He started in provincial theatre in Western Canada around 1911 (having emigrated from England in 1909) and worked with various theatrical companies for the next 8 or so years. Then he started working as an extra in Hollywood and worked his way up the ladder, gradually getting better parts. But it was a hard slog. His overnight success in Frankenstein (1931) had been 20 years in the making. Karloff's daughter, Sara, was instrumental in the information found in your book. What is she like, and how does she feel about her father's legacy? Sara has always been very encouraging. When I first contacted her I just wanted to let her know of the new information I had unearthed, information that contradicted some of the much reported facts about her father. She urged me to continue and what had originally been a private project developed into a full blown biography. Throughout the whole process Sara couldn't have been kinder. I am so grateful to her. And being able to now call Sara a dear friend - well, that is something I could never have imagined. It's the icing on the top of the cake! When the book was finished my publisher, Tomahawk Press, suggested that I ask if Sara would be willing to authorise it. I had never considered this as I always had the impression that authorised biographies were, in fact, sanitized, with any less than flattering information removed so as not to upset the subjects family. Yet I was thrilled when Sara agreed - and she never asked me to change, or omit, a single word. Sara regularly attends conventions and screenings (we presented a Frankenstein/Bride of Frankenstein double bill at the BFI last November) and her father's fans are always keen to speak to her and pass on their admiration for him. Sara is always happy and willing to do so. What is one of the facts people don't know about Karloff that you think people will be surprised about? There's several: He was one of the founding members of the Screen Actors Guild, he played Captain Hook on stage in Peter Pan, he won a Grammy under the category Best Recording for Children for his narration of Dr. Seuss' How The Grinch Stole Christmas! What are your personal favourite Karloff movies and why? Off the top of my head I would say Frankenstein (1931) and The Body Snatcher (1945). The role of the Monster in Frankenstein is, of course, iconic and Karloff's portrayal in the three Frankenstein movies is still unsurpassed. He brings such pathos to the (non-speaking) role and would receive letters from children (who, at that time, were allowed into cinemas to see the film) expressing sympathy for the Monster. Those children, he said, saw beyond the make-up and really understood. Of Karloff's speaking roles his portrayal of Cabman Gray is, by far, my favourite Karloff role. The film is an excellent adaptation of Robert Louis Stevenson's short story of the same name. Karloff simply shines in his role of the unshaven, manipulative body snatcher. If anybody had doubts as to Karloff's acting ability I would urge them to see this film. The addition in your book of photographs from behind-the-scenes and on-set are fantastic. Did you come across any issues licensing photos? No. I had no troubles at all. Everyone was really helpful. Is there anyone you wish you could've interviewed for the book (dead or alive) that you unfortunately couldn't? What would you have asked them? Oh, lots. There's Frankenstein's director James Whale, the great make-up man Jack Pierce, Lon Chaney Sr. (who knew Karloff before Karloff became famous), Bela Lugosi, the list goes on and on. But I think the people I'd most have liked to have talked to are those back in Karloff's earlier years. I'd like to speak to Karloff's first wife, Jessie Grace Harding, who Karloff married in Vancouver in 1910. I'd like to know what happened. Why did Karloff pack up and leave, and why did she stay? Was it simply due to his ultimate ambition to be an actor? I'd like to speak to Karloff's later paramour, the actress Helene Ripley (a.k.a. Margot Beaton) who, while touring with Karloff later in that decade, advertised herself as Mrs. Karloff. There's no evidence of a marriage. Then there's another actress Olive de Wilton, who was close to Karloff - although it seems to have ended acrimoniously. Again, what happened? Then there are his many siblings - especially his favourite brother George, who was also an actor for a while. But the person I would have loved to have talked to the most would have been, of course, Karloff himself - even though I doubt he'd have revealed much. Although he would talk about his life there was only so much he would say, and some of that was misleading or just plain wrong. I suspect he would hate my book for revealing things about his private life that he would consider to be just that - private. Do you think the popularity of DVD, Blu-ray and streaming has helped increase recognition of Karloff? Which home media companies do you think have released some sterling extra features on Karloff? Of course it's helped. When I first became acquainted with Karloff's work the only way you could see one of his films was if it was shown on TV. With the advent of home video, DVD and now Blu-ray it means we can watch his films (those that are available, of course) whenever we wish. A lot of Karloff's work has become available over the years but there's still some way to go. His output on Blu-ray is rather small at the moment. 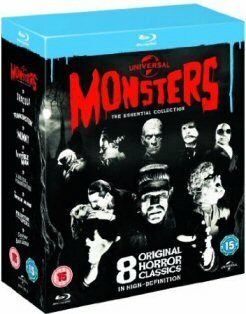 Universal's Classic Monsters Collection on Blu-ray is a great place to start as it includes Frankenstein, Bride of Frankenstein and The Mummy. The extras are good too but, sadly, have no new special features (they're the same as on the older dvd releases). Arrow Films release of Black Sabbath is excellent as it includes the original Italian version plus the re-edited US release (which features Karloff's own voice - which is always a good thing). I understand that Arrow is also planning to release The Comedy of Terrors too!